This combination photo shows Cardi B at the Warner Music Group pre-Grammy party in New York on Jan. 25, 2018, left, and Nicki Minaj at the 14th Annual CFDA Vogue Fashion Fund Gala in New York on Nov. 6, 2017. 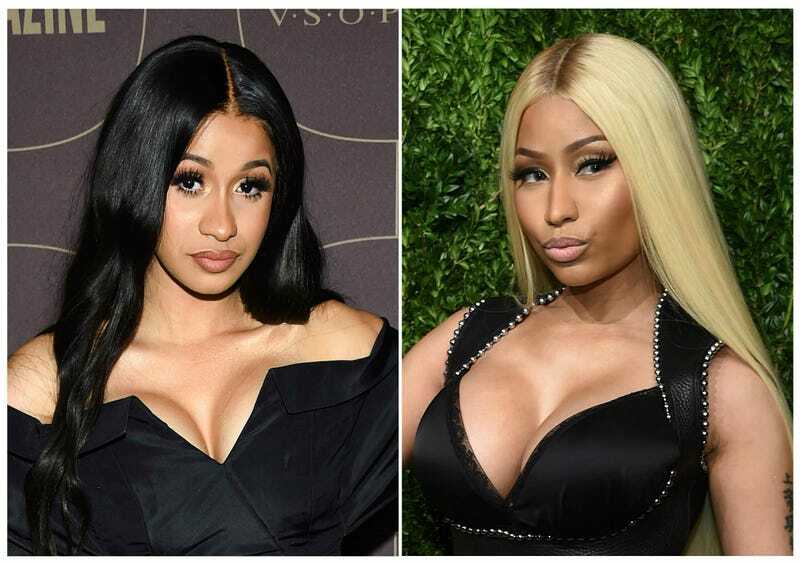 Cardi B and Nicki Minaj will headline concerts at the 7th annual BET Experience at L.A. LIVE, held days before the 2019 BET Awards. BET announced Wednesday that concerts will be held June 20 through June 22 at the Staples Center. The 2019 BET Awards will take place June 23. While female recording artists have always been at the forefront of the music industry, it’s behind the scenes where things gets a bit more scarce. In fact, according to Dr. Stacy Smith’s USC Annenberg Inclusion Initiative study, only 2 percent of music producers and 3 percent of engineers/mixers within the music industry are women. Thankfully, the recently announced Producer and Engineering Inclusion Initiative is looking to jumpstart those abysmal numbers by confronting the rampant gender inequality that permeates the music industry. And it’s backed by some pretty heavy names: The aforementioned Nicki Minaj, Cardi B, Chance the Rapper, and a host of other artists, producers such as “4:44" beatsmith No I.D. and Salaam Remi, record labels such as Atlantic Records, Def Jam, and RCA, managers and management companies such as Scooter Braun and Quincy Jones Productions, and agencies such as Roc Nation, William Morris Endeavor, and She Is The Music. For sports heads, this sounds eerily similar to the Rooney Rule—in which NFL owners are required to interview minority candidates for head coaching or general manager vacancies. But while the results in the NFL have been varied—as there are currently only 3 minority head coaches out of 32 teams despite the players being 70% black, and often times interviewing minority candidates is purely performative—this initiative does provide women with a seat at the table. Which isn’t the end all be all, but is definitely a step in the right direction. Umm ... Is Nicki Minaj’s New Merch Trolling Cardi B? Jenifer Lewis Calls on Cardi B and Nicki Minaj to Get Out the Vote!